A gravel driveway can offer a great bridge to a natural feel in your living space that is often lost with the use of hard surface structures such as concrete and coble stone. Sometimes people shy away from from using gravel because they think it will be high maintenance with lots of weeds, or they will be forever filling potholes where stones have moved or there will be stones throughout their lawn. Taking a trend from the European market, Natural Paving allows you to have the best of both worlds. With our honey comb cells we prevent the gravel from displacing and spreading which means there are no potholes, no puddles and no migration of stones to unwanted areas like lawns, gardens or in your house. The gravel is still loose but becomes so stable you can walk on it with high heel shoes. The specified size of stone of 8-14mm means they will not be picked up by car tyres or shoe tread, and the abundance of colour variation available locally, and from around the nation, offer contrast and character to any property. Prepared with a permeable base, councils see Natural Paving as permeable and the high attenuation offered in the voids amongst the stones prevents stormwater runoff into drains and gutters. There are options for grassed driveways as well, and paths and patios can look amazing with a natural finish that is practical and esthetical outstanding. Your Zones consultant can offer advice on how Natural Paving can work for you and be used to enhance your property. What are the pros and cons of using gravel for my driveway? Gravel – made up of a mass of small water-eroded or pounded stones – is is unquestionably the most affordable paving option on the market. Durable and easy on the eye, gravel driveways are also easy to install and there’s no need to seal them, making them a great option for DIY builders. The only downside with gravel is that it does require ongoing maintenance. Which type of gravel should I choose? Installing a driveway requires using three types of gravel. To form a strong base and also ensure optimum drainage, the first layer should comprise tennis ball-sized rocks (also referred to as #3). The equal depth depends on how heavy duty your driveway needs to be for details on calculating the depth. The foundation should be topped with another layer of the same depth, of golf ball-sized rocks (#57). Again, this layer reinforces the base and also helps with the the drainage. The top layer will be made up of marble-sized, dense-grade gravel, which contains dust and smaller pieces of rock that form a cement-like bond when compacted. These rocks can include limestone, granite, concrete and shale, and they’re available in colours ranging from black and grey to rusty tones, which gives you good flexibility in creating a surface that naturally matches your landscaping and the design and colour of your home. Gravel driveways are prone to stones scattering – you can prevent this from happening by welding natural, permeable, geotextile honeycomb mats to the base. This will not only to stabilise pebbles, but also keep weeds at bay. The best pebbles to use in conjunction with these mats are vehicle-grade 8 to 14mm pebbles as they’re capable of easily carrying loads of 100 tonnes plus. Edging along the driveway will also help contain ‘flying’ pebbles. What does it cost to install a gravel driveway? The cost of gravel depends on the size of the stones (between 2 and 64 mm) and the type of gravel that you use. In New Zealand, a rough estimate is around $160 per square metre upwards (South Island stones are prettier and therefore likely to cost more). As the size of the stones also determines the volume of the gravel, choose the gravel first before digging the depth of your driveway, and then calculate how much you material you need. What do I need to consider when laying gravel? As with other types of paving materials (such as concrete, asphalt and resin bound), preparation is key to building a driveway that will last the distance. Before you lay the gravel, remove the top soil and transfer it to your garden. This soil is filled with organic matter that’s great for growing veggies and other plants, but too sponge-like and unstable for the purpose of a driveway. However, the layer beneath the topsoil is hard and dense – the perfect foundation for your gravel driveway. The depth of the gravel is another major consideration, and is based on what you use the driveway for – in other words family cars or heavy vehicles. Each layer of gravel should be at least 100mm deep. The size of the stones also matter greatly. Smaller stones will give you a more even coverage but avoid ones that are too tiny as they tend to be unstable – not to mention a potential recipe for slippage. Larger rocks (around 10 to 20mm) will compact more easily but are harder to walk on. When using larger stones, you’ll need to allow more space for your driveway surface – around 12mm. Proper grading is another crucial factor in creating a fully functional gravel driveway. In order to achieve this, you need to create a crown by elevating the centre of the driveway slightly so the water can drain off the sides. If you live in a high-rainfall region such as many parts of New Zealand, we recommend that you build ditches on either side of your driveway to ensure proper drainage. Compacting each layer of gravel before applying the next layer is also of the essence. Compacting gravel is hard work, so it’s recommended to call in the pros to complete this part of the process. How do I keep my gravel driveway in good nick? Provided you give it the required ongoing TLC, your gravel driveway can last as long as a whole century (no kidding!). You’ll regularly need to rake the gravel to keep it even and looking the part, though, as well as applying a herbicide to ward off weeds and pests. You can use a low- or no-chemical product such as DENZ, plus It’s a great idea to add a herbicide or install weed-resistant landscaping fabric during the preparation stage (after you’ve removed the topsoil). Gravel also requires more intensive TLC long term. 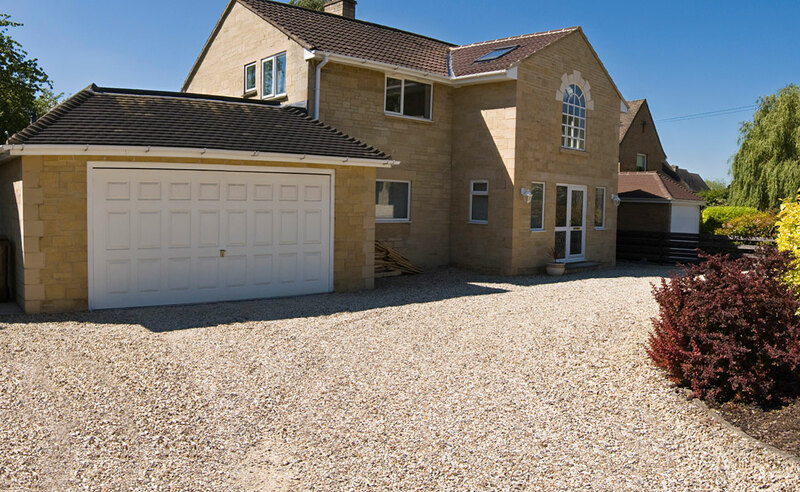 Depending on the type of stones that you choose, how efficient your drainage is, how often the driveway is used and by which types of vehicles, you’ll need to top up the gravel to keep the surface even and at its optimum level every two to four years. This is particularly necessary if the gravel tends to shift around a lot, for example if your driveway is sloped, or if you live in a snow-prone area. You also have more options to choose when installing driveways: Concrete, Asphalt and Resin bound.